Definition - What does Anjaneyasana mean? Anjaneyasana is a yoga asana named after Anjani, the mother of the Hindu god, Hanuman. From adho mukha svanasana (downward-facing dog pose), one foot steps forward between the hands. Toes are pointed forward, the knee is bent at a 90-degree angle and is placed right above the ankle. The back knee lowers to the floor, the top of the foot facing the floor. The hands may either rest on the floor beneath the front knee or reach overhead toward the ceiling, palms facing each other. Anjaneyasana is referred to in English as crescent moon pose when the hands are lifted or as low lunge pose when the hands are on the floor. Anjaneyasana improves balance, stability and focus, and can help with sciatica. It also opens the hips and stretches the quadriceps. As a heart opener it also benefits the anahata (heart chakra). Stimulating the heart chakra helps to improve balance, calmness and tranquility. To ensure stability in this pose, the mula bandha ("root lock") and uddiyana bandha ("abdominal lock") should be engaged. 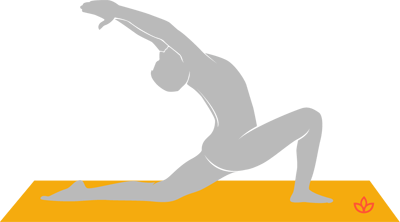 If the stability remains difficult, this pose can be practiced in front of a wall, pressing the front foot against it. In order to get a bigger opening for the chest, the spine can be taken into a backbend. If the back knee hurts, a pillow can be placed below it. If it is a problem to reach the arms overhead, the hands may be placed on the hips or in anjali mudra in front of the chest instead.